"I went back each day for fifteen days, and each time, except one Monday and one Friday, the lady appeared and told me to look for a stream and wash in it and to see that the priests build a chapel there. I must also pray, she said, for the conversion of sinners. I asked her many times what she meant by that, but she only smiled. Finally, with outstretched arms and eyes looking up to heaven, she told me she was the Immaculate Conception." In the middle of the nineteenth century, Lourdes was a small garrison town of four or five thousand inhabitants, situated in the foothills of the Pyrénées on the River Gave. It had a castle fortress, the sign of a fighting past, and for its size was up-to-date and progressive with the bulk of the population consisting of agricultural workers and quarrymen, and in the main practising Catholics. 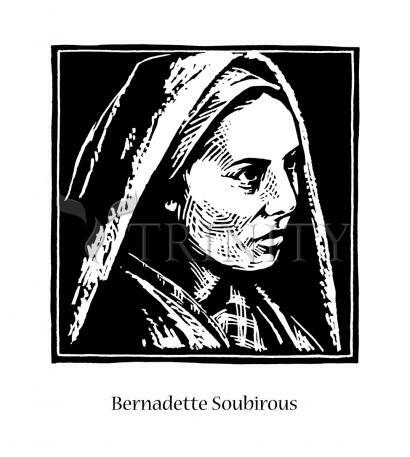 Bernadette Soubirous was the eldest of five children of hard-working parents who had fallen on hard times, and from operating a successful mill had been reduced to living with their family in one small room called the Cachot, which can still be seen today. Bernadette could hardly read or write, and suffered several childhood illnesses leaving her weak and asthmatic, and small for her age. From a very early age though, she showed signs of having immense faith in God, and when she was told she was stupid because she was unable to learn her Catechism, she whispered in a characteristic way that: ’At least she would always know how to love the good God.‘ She was a simple girl who worked partly in the house and partly, when with her aunt in Bartrès a village 4 miles from Lourdes, in the fields where her special task was to watch the sheep.